Kicking up dried leaves, low sun, lengthening shadows, fairy rings, cold fresh air: Autumn is my favourite season. I live in England, a temperate maritime climate, which means that we get the warmth of the gulf stream till quite late in the year. It also means we get a lot of fully-laden clouds looking for somewhere to drop their rain! This combination accounts for the greenness of the British Isles - what joy when all the blowsy heavy green of summer turns to burning golds and reds in the Autumn! And it’s the perfect time for the dogs too. It’s not too hot, nor yet too cold. Early in the Autumn there is not much mud, and there’s no ice to cut paws, or salt to dry pads. The sun is gentle with a body-infusing warmth we seek out. The streams are flowing and the pond is still warm enough to swim in. The ground is soft and good to run on. There are endless branches and pine cones, brought down in the autumn gales, for the dogs to discover, toss, carry, and chew. There are blackberries for all of us to forage for. Fallen branches make great climbing frames, smaller ones are jumped over or scrambled under. 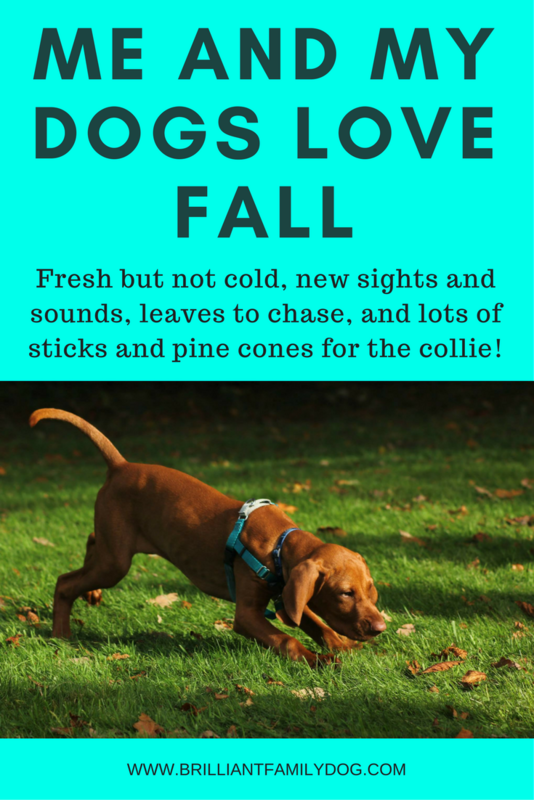 Leaves and feathers dart past in the wind for puppies to chase and catch. The beauty is all around us. The last leaves cling to the trees and flutter and flap in the growing winds. The air is cold and fresh in your lungs, your breath misty. As the dogs run they billow out clouds from their soft mouths, the heavy damp scents drawing them on. The dogs will show you things: the steam rising from an occupied burrow, the disturbed ground where squirrels have been burying their autumn bounty, the sound of the wind high in the treetops. Twigs crackle and snap as they bound across them, nose down, exploring the scents they release as they run across this crunchy carpet. As we move into late November and December we get heavier rain, faster streams, choppy waves on the pond, gales to buffet the last leaves from the trees. It’s time to wrap up well, to put a fleecy jacket on the whippet, an all-over rainsuit on the poodle. The collies delight in the wet and the cold, and scorn outerwear! Children are in school, people are huddled in the warmth of their homes, and there is a blissful solitude on walks. Just me, my dogs, and nature. Then, as the sun slides behind the hills and the sky darkens, home we go, to a rubdown and bones for the dogs, a hot drink for me, and a doze in front of the fire for all of us. THIS E-COURSE IS A BONUS FOR YOU WHEN YOU SIGN UP TO RECEIVE EDUCATIONAL EMAILS AND OCCASIONAL OFFERS FROM ME. YOU CAN UNSUBSCRIBE AT ANY TIME. Success! Now check your email to find your first Lesson.